As always, vote in the poll if you haven’t yet… Have I ever gotten this many poll responses before? It’s almost up to 300. Oh, my gosh! I just got almost breathless when I discovered this gown! Such a wonderfull colour! I’m just like… WOW!!! It’s beautiful! Oh Liana! It’s breathtaking as is!! Oh my, that is gorgeous! And the belt just adds the perfect touch. Truly something Goldberry would be proud to wear. Love this!! So gorgeous. A dress I wish I owned, and oddly almost exactly the way I pictures it. By the way, I glued the October birthday dress in my mom’s birthday card today. She LOVED it. This has absolutly NOTHING TO DO WITH IT but where did you make this site? Saetbyull, I’m afraid I don’t understand the question… Where do I live, you mean? Or where is the site hosted? I was torn in answering your poll (on which dress I liked best). It was between this one and the last one the white elven dress. Both very beautiful and two of my favorite colors. I think that this dress is gorgeous. Definitely a LOTR type-thing, and, I think, a perfect adventurer’s gown for an elf. I love the droplets on the skirt and the way the whole dress flows. It would be neat to have a tight, sleeveless, brown bodice over the upper section, like in the hobbit dress. But the skirt would be flowing. 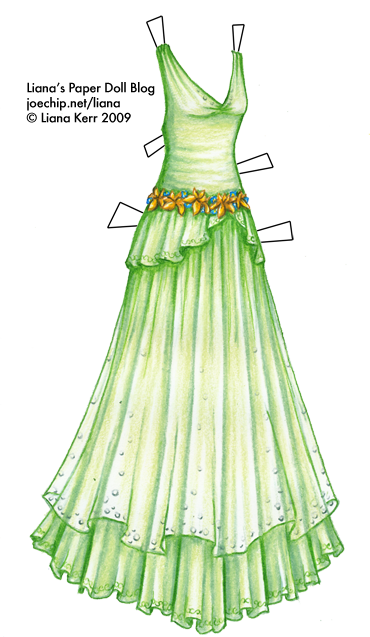 That’s what I like to do, is cut out the hobbit-dress vest and put it over many other gowns. It’s lovely!